Galit, over at These Little Waves is running a linkup in conjunction with Alison at Mama Wants This, called “Memories Captured” and I found out about it when I went to visit my friend Deborah over at MaNNaHaTTaMaMMa. Ain't the internet grand? Photo: April 2004, Jacob & Ethan at 20 months. Not talking yet, so below is my interpretation of their expressions in this photo that PERFECTLY captures their personalities for the first two years or so of their lives. Jacob: "Hey buddy, how-ah-ya? Nice ta meetcha!" Ethan: "Who, may I ask, are YOU? Why have you presented yourself? And what can you do for me?" Also? The hand in the photo, holding Jacob's hand at the far left is my mother's. She was very much in their lives when they were little, the kind of Grandma who, in spite of being in her 80s with creaky arthritic knees never hesitated for a moment before getting down on the floor to play with them or going for a walk to the playground, like this day. 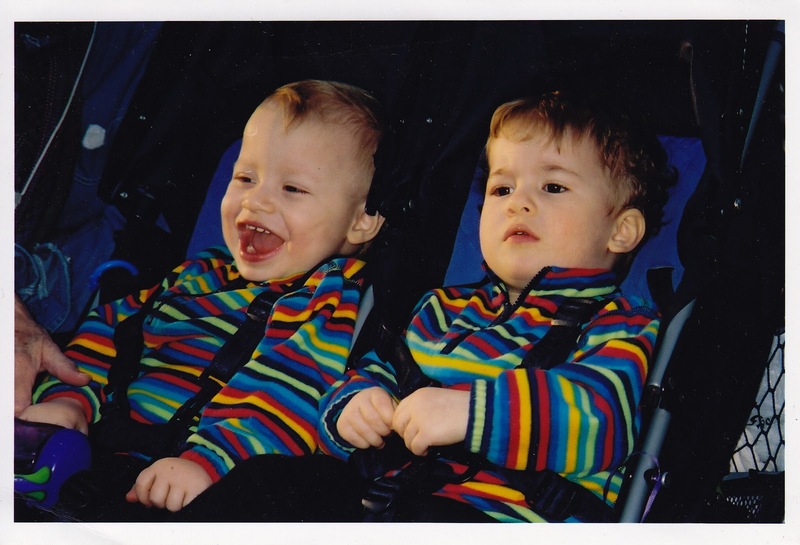 I love looking at this photo as a reminder of that more innocent time before we knew about Jacob's autism, when we just thought the boys had speech delays. In those early years, Jacob actually had the more outgoing personality. He was a giant flirt. Back in the day, we thought his lack of "stranger fear" - which Ethan had in spades - just meant Jake was uber-friendly. Little did we know it meant he wasn't processing that there might be anything to be afraid of, part of his autism constellation. A short time after this photo, when Ethan had a language explosion and Jake didn't, their personalities switched and Ethan began to reach out much farther into the world than Jacob, who was getting more spacey and "dreamy" (as his rather stupid first speech therapist called him). Ethan went on to make friends, many friends, while Jacob has really yet to make a one. So it's nice to look back on this time when Jake seemed to be so socially connected. When "connected" meant smiling and laughing and batting his long eyelashes at pretty girls. Because THAT? He is still good at, my beautiful boy. So, come join in and link up your own photo with Alison or Galit.